The roof on your Newport home can take quite a beating over time. Being constantly exposed to the beating rays of the sun, pounding rain, snow, sleet, hail, and wind, as well as any falling debris from severe storms can all take a severe toll on your home's roofing over the years. Your home's roofing is probably the single most important surface on your entire home, and provides a large part of your home's overall comfort and security. In addition to the functional aspects of your home's roofing, it is also a major component in your home's exterior design. A beautiful roof is a great way to improve the overall aesthetic and visual appeal of your home, but when you have a roof that is looking worn and weather due to the build up of black streaks of mold, mildew, or other contaminants, it can start to severely depreciate the value of your home overall, as well as causing you serious structural concerns if these contaminants aren't addressed in a timely manner. If you are suffering from unsightly streaks and spots on your home's roofing, it's time to call in the professionals with the skill to get everything back the way its supposed to go. 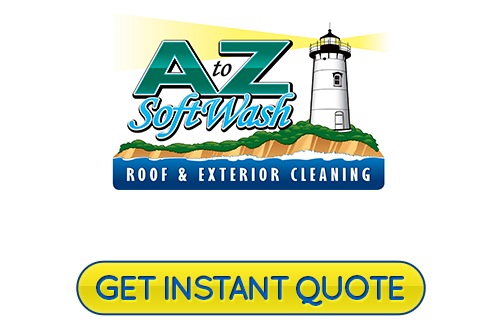 The professional Newport roof cleaning and pressure washing contractors at A to Z Softwash are here and ready to assist with all of your roof cleaning needs. Our high quality roof cleaning methods are safe and effective, and each and every one of our cleaning specialists are fully trained, experienced, and skilled, and are ready to make sure you have the quality cleaning that you need to get your home's roof back to its original pristine condition. All of our professional roof cleaning services are carried out in a prompt and professional manner that is guaranteed to get your home back to looking its best in no time at all. This is just part of what has made us the premier choice for roof cleaning services throughout the Newport area. Give our Cape Cod roof cleaning company a call today if you have any questions about our full line of professional roof and exterior cleaning services, or if you would like to schedule your appointment for service with one of our experienced specialists. Our team of experts are always standing by and would be more than happy to assist you in whatever way we can. We look forward to working with you. There are a number of reasons that you should invest in the regular cleaning needed to keep your roof looking its best at all times, least of which is that it allows your home to continue looking great all year round. Having a clean roof is a great way to enhance the curb appeal of your home, increase your home's value, and also just increase your pride in the way your home looks. In addition to the cosmetic value of keeping your roof clean, however, regular cleanings help to prevent the buildup of moss, algae, lichens, and other contaminants from overrunning your roof and causing damage to the underlying structure. Roof cleaning is almost always something that is better left to the professionals, as it can be dangerous and the risk of causing damage is great if you aren't familiar with the process. 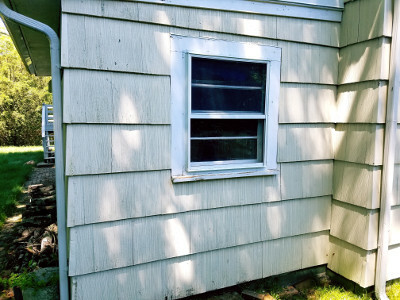 Softwashing is a technique that's used to wash the exterior of your home without the threat of damage that sometimes comes with traditional pressure washing. High powered pressure washers can cause damage to a number of different aspects of your home, but with a milder pressure along with a specialized cleaning agent, you can get a superior clean for the exterior surfaces of your home. 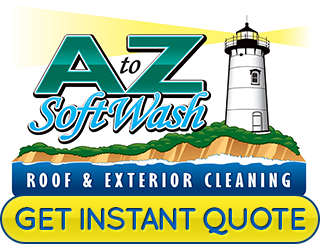 If you are looking for a professional roof cleaning and soft pressure washing contractor in Newport, give us a call today at 508-209-7795 or fill out our online request form.